Sift the flours and a large pinch of salt into a bowl; make a well in the centre. With a wooden spoon, gradually beat in the egg and 100ml water to make a smooth batter. Stir in the milk. Cover and chill for 2 hours. For the filling, heat the oil in a frying pan over a low heat. Stir in the onion, bacon and thyme, season with black pepper and cook for 10 minutes, until soft. Turn up the heat to medium, add the garlic and stir for 5 minutes until golden. Preheat the oven to 110°C/gas ¼. Heat a medium, non-stick frying pan over a medium heat. Dip a scrunched-up piece of kitchen paper into the vegetable oil and wipe it over the pan. Pour in a small ladleful of batter and swirl around. Cook for 1 minute until set, then turn over with a palette knife. Cook for 1 minute, then transfer to the oven while you cook the rest, oiling the pan for every other pancake. Just before assembling the galettes, stir the Gruyère and crème fraîche into the filling; heat until the cheese melts and coats the onions. 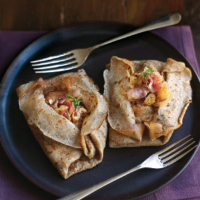 Season, then place a spoonful of filling on each galette. Fold each pair of opposite sides inwards, then pull back two edges to reveal the filling before serving. Garnish with snipped sprigs of thyme. A refreshing cider strikes up an entente cordiale with the Breton finesse here.